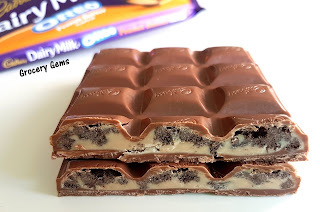 It's been ages since I last reviewed a chocolate bar but believe me it's not because I don't eat them anymore. No, it's simply that I haven't found anything new recently that appealed enough to me to review. That is until I spied these new Oreo flavours from Cadbury Dairy Milk. 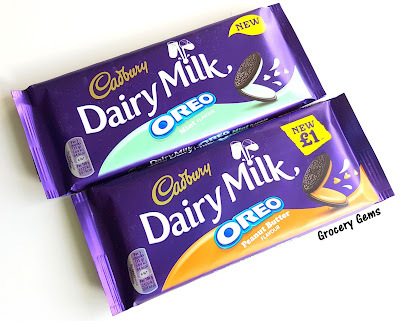 As a fan of the original - see my review from all the way back in 2012 of the Cadbury Dairy Milk Oreo - I knew I had to give these new varieties a try. Also, peanut butter and mint are two of my favourite flavours anyway (not together obviously!). Fun spoiler alert: This is a split review - I loved one bar and hated the other. Can you guess which? Cadbury Dairy Milk Oreo Peanut Butter Flavour Review: This one is simply described on the packaging as a 'milk chocolate with a peanut butter flavour filling'. In fact it's so much more than that as it's also jam packed full of crunchy Oreo pieces. As soon as I opened the packaging I could immediately tell this was a peanut butter flavoured bar, the scent is immediately very peanutty. I liked the familiar creamy and crunchy texture here, which is just like the original Cadbury Dairy Milk Oreo bar but that's just about the only good thing I can say about this one. Unfortunately, the actual peanut butter flavour didn't work for me or live up to the promise of that initial opening. Peanut butter is a fairly simple flavour in my mind to get right and this just doesn't capture it at all. Instead the flavour that I'm getting is a bitter peanut one with a hint of salt and a weird aftertaste of coffee. In fact I'm getting queasy just thinking about it. I could only eat a few pieces of this one and it will never darken my tastebuds again. 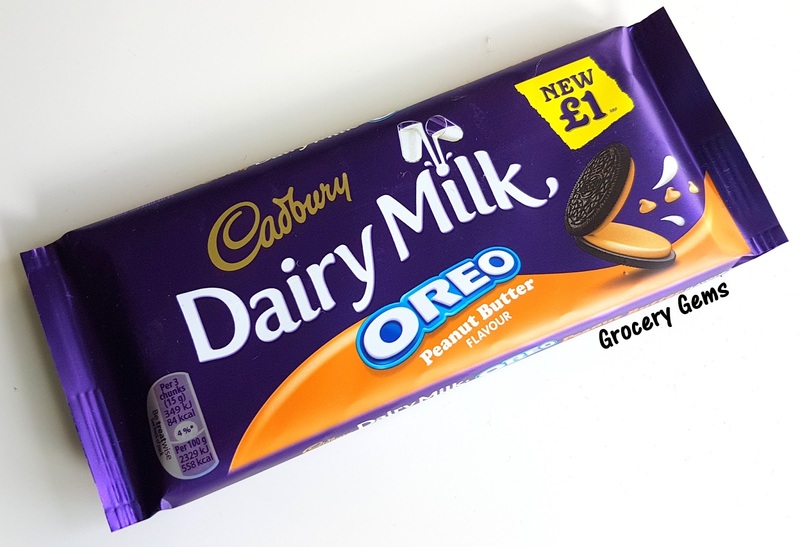 I'm sorry Cadbury, but don't worry there's much better news below! 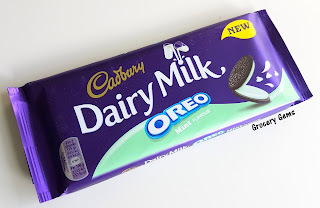 Cadbury Dairy Milk Oreo Mint Flavour Review: Have I ever mentioned before how much I like a mint flavoured chocolate? Especially when it's not a classy dark chocolate affair but just a crazy sweet milk chocolate like the Aero Mint Bubbles. 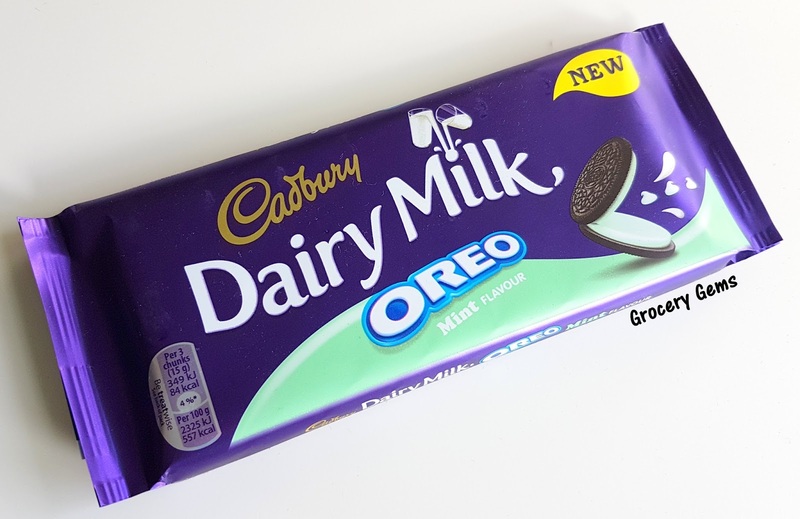 Luckily for my taste buds they were much happier after trying the Cadbury Dairy Milk Oreo Mint. 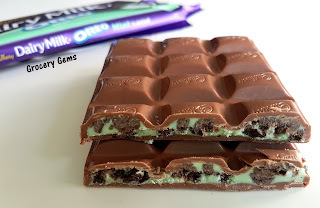 It has all the crunchiness from the Oreo pieces coupled with a smooth and deliciously creamy mint filling. It's not going to break any boundaries for flavour innovation but it's a solidly tasty chocolate. Taste buds rejoice! RATING: Peanut Butter - 3 out of 10, Mint - 8 out of 10. Buy them again? : Peanut Butter - No, Mint - Yes. Nutrition: 84 calories per 3 chunks. Price: £1.00p each 120g bar. I felt exactly the same - the peanut butter one was just grim, but the mint one was pure yummy! Thanks Kate! I'm always a bit nervous giving such a negative review so it's a relief that I'm not the only one who didn't like it. You're certainly not! I don't like to throw food away, but the peanut butter bar hasn't been touched since I first tried it.. I'm really not on the peanut butter fan train so I wouldn't buy that one as I know it's not for me. Out of these I like the mint one the best. While I did like the peanut butter one I found it a little too sweet for what it is.